With the Skins done for the year, and the Nats and United not due to report for weeks yet, and the horrific season for the Wizards, our only highlight this year is the Caps. In fact, with things as dismal as they are, I’d venture to say unless the Caps can press hard for Lord Stanley’s Cup, this would be as dire a year in Washington Sports as we’ve seen in some time. The Capitals averaged more than 5 goals a game for the last two weeks. Five! Hell, that’s practically more runs than the Nationals were scoring for long periods of last season. Part of that is Ovie/Semin/Backstrom, but the trade for Jason Chimera has paid off, as he is gelling well into the third line, picking up 5 points in the last two weeks. His pickup has made some of the difference for the Caps in both a physical, and an offensive sense. The Caps have also recalled defenseman John Carlson to the bench, fresh off leading the US National Junior Team to the World Junior Championship gold-medal game, where he picked up a pair of goals, including the game winner. I’m looking forward, though, to the return of Semyon Varlamov to the goal, as Jose Theodore is a rough stand-in for the far more agile young Russian. Varlamov aggravated a groin injury in a rehab game at Hershey, but he should return to the squad this week or next. The Caps face the Red Wings on Tuesday, look for Ben Rome’s very first behind the scenes game report on Wednesday. When this season’s done, I think just about all the Wizards will be able to say is, “At least we’re not the Nets?” Antawn Jamison is a putting up the points, Brendan Haywood is getting the boards, but aside from that, the Wizards are an unmitigated disaster. Sluggish on the run, and wide right from the field, the distractions are no doubt taking a toll on the already hurt Wizards. Let’s look at the Arenas Problem real quick. Arenas has been suspended indefinitely by the Commissioner, plead guilty to a felony charge of gun possession and faces probably six months in jail at the max. The felony conviction is enough to void the rest of Arenas’ $111M contract and free up a significant amount of cap room for the Wizards to start to rebuild their team. The other wildcard is what will happen to the Wizards with Abe Pollen’s death. There’s the rumor that Ted Leonsis will buy Abe’s share, which would give the Wizards a deeply-involved owner who will be committed to excellence in the longterm, and that would be, I believe, the best of all worlds. The Post covered this in depth today, and thinks the team and the Verizon Center are worth half a billion dollars. 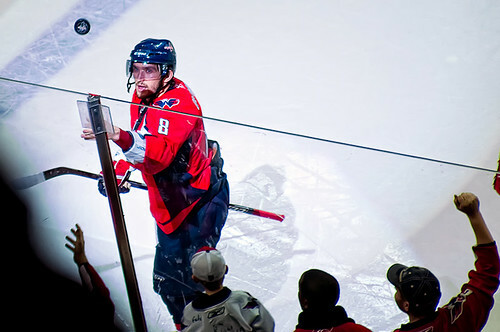 Leonsis was not popular with Caps fans at first, but now I think they might trade a limb to keep him forever. Moving him to the Wizards front office as well could signal a renaissance for the hapless Wizards. The SuperDraft in Philadelphia netted United one Jordan Graye, DC Native and DeMatha grad, who will have the chance to make the roster with United. He’ll likely end up as a sub for Namoff on the right side of the field. In addition to adding Troy Perkins, United also exercised their option on injured keeper Josh Wicks, who is likely to stay with the team through his convalescence and return. Just under five weeks remain before pitchers and catchers. We’re into the Lent of baseball, folks. Varlamov didn’t aggravate the groin injury in the rehab start, he had a knee injury.